Christmas Island is an external Australian territory, and it is an island south of Indonesia in the Indian Ocean. As you can imagine, you can find plenty of beaches on Christmas Island to relax and have some peace and quiet. Since Christmas Island is not a famous destination, you will not have issues with overcrowding. At the same time, you can do plenty of other things. You can go hiking and explore the island, you can dive and snorkel in some area, and if you arrive on the island during the October-December months, you can witness Christmas Island Red Crab Migration. It is a spectacular view. But before you travel to Christmas Island, you need to see whether or not you need a visa to access the island. Since the island is Australian territory, the visa policy of Australia applies. However, you need to keep in mind that Australia has agreements in place that grant visa exemption to many nationalities. Some of them need to apply for an ETA, which is an electronic authorization before entering Australian territory. At the same time, electronic visas are available for the countries in the Schengen Area, but it is called eVisitor and grants a 90-day stay. The nationals of New Zealand can access Christmas Island with no restrictions since Australia and New Zealand both signed the Trans-Tasman Travel Arrangement. 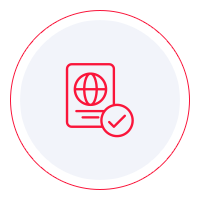 All the other nationalities that are not visa exempt or eligible for an electronic visa must submit an application at the nearest diplomatic mission of Australia. To find out in which category you fit in, we recommend that you use iVisa’s Visa Checker. All you have to do is click on the Visa Checker button you see in the top right corner and fill in the boxes. You must select your nationality from the drag-down menu on the left, and on the right, you must choose Christmas Island as your destination. The result will tell you if you need a visa or not, and if you do, you will be given some useful information such as a list of the nearest embassies where you can apply. Even if electronic visas are available for Christmas Island, iVisa does not process applications at the moment. That will change in the future, but in the meantime, we can help you with some valuable information. Our support service is available 24/7 should you have questions. As far as the requirements go, you need to find out which they are to ensure that you meet them. You can find a lot of information online, but we advise you to use it as a reference only. The info you see online is not always the most reliable. In consequence, we recommend that you call the issuing authority and ask your questions there. They can give you the most legitimate answers. Meanwhile, what we can tell you is that all travelers who take a trip to Christmas Island need to have a passport that does not expire for at least another 6 months from the date of arrival. Even though we cannot provide further assistance with the process of obtaining a visa for Christmas Island, we hope that the information above is somewhat helpful.